IF SUPPLYING ARTWORK, USE THESE GENERAL PRINTER SPECS. These are very commonly used specs used by most printers to produce high quality reproduction. PREFERRED BEST FORMAT IS ALWAYS "PDF". All fonts converted to outlines/curves. VERY IMPORTANT: Make sure all artwork includes 3mm extra bleed than the size of chosen card. The 3mm bleed around edges will not be seen and will be cut off. (Read below for more info). PLEASE NOTE: For jobs where we have been asked to design or simply do changes - we send final proofs to clients for checking and sign off prior to printing. We don't send proof if artwork is supplied unless requested. WANT TO DESIGN YOUR OWN CARD? We suggest using CANVA.COM - it's FREE. You have control AND we get the final artwork ready for high quality printing. 2). include a minimum of 3mm extra bleed on all edges (see below). 3). We always check first anyway before print, If any questions we will contact you. IMPORTANT: To offer our services at discounted rates we have procedures in place to ensure accurate colour reproduction, quality, speedy turnover and delivery - this is to eliminate wasted time for both you and us going back and forward. For this reason any job which doesn't follow these procedures may incur additional fees as you can understand. VERY IMPORTANT IF SUPPLYING ARTWORK IS "BLEED" - WHAT IS BLEED? If you have images or a background colour that extends or bleeds off the cut/trimmed end of the card edges it is VERY IMPORTANT that you make your artwork go beyond the finished trimmed size so when we cut your cards it doesn't leave any white spaces. For example, if the finished card size is 90mm x 54mm. Your artwork should include an extra 3mm on all around edges- so your artwork will be 96mm x 60mm. WHAT IS PRINT SAFE AREA? As a general rule you should keep any visual or readable information at least 3mm INSIDE the final cut size. If you want rounded corners then allow extra room on the corners that you want cut rounded. Basically this is a MARGIN. WE CAN ONLY PRINT WHAT YOU GIVE US - GOOD and BAD! Most artwork includes both the use of TEXT and IMAGES and assembled and formated in a graphic software program. 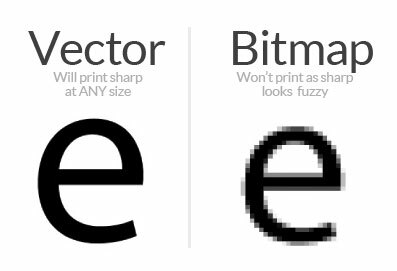 As you can see from the above image that it is best to send text as VECTOR artwork (pdf, eps) instead of Bitmap (jpeg, tiff, psd) especially on small type. To do this all you have to do is save your artwork as a PDF from your graphics software. Remember to convert the type to outlines or curves as mentioned below about fonts. This will convert the font to an object and will print sharp no matter what size. Images are called 'Bitmaps' and are made of square pixels (the quality or resolution as DPI = dots per inch) = the more pixels (or dots) the more detail so the better the print. 300dpi is the best at the finished size required, any higher DPI doesn't show any visual benefit - but just makes the file size much bigger. Even though an image may look OK on your computer at home or when you print it on you printer but when going to HIGH QUALITY PRESS images NEED to be no less than 300DPI at that finished print size to ensure the best quality. So always get good images from the start. Don't get a low 72dpi image off the internet for example and then in Photoshop and the size bigger DPI (this is called "up-sizing") - it will only make the image blurry. But you CAN get a BIGGER image and reduce it "down-sizing" it to the size you want because it already has the fine detail in it. As you can understand, there are millions of fonts and type styles available - free and commercial - if you send your artwork with a unique font in it - If we don't have that font it will not show. THE SOLUTION - The best method is to supply your artwork as a PDF - This actually embeds your font in the file then we can handle from there. Another way is if you use a graphic program then there will be the ability to convert fonts to curves or outlines - this basically turns any fonts to an graphic object = not font issues. 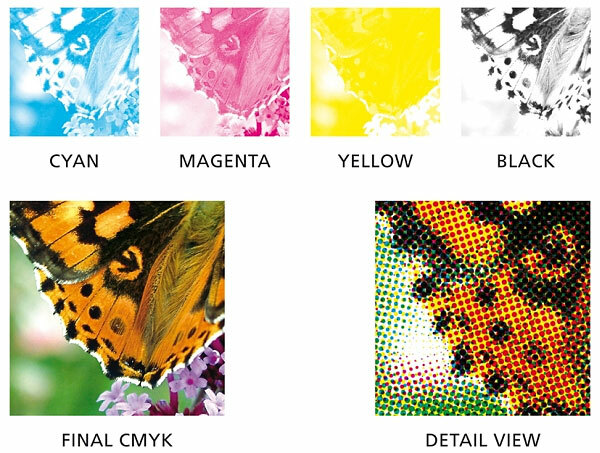 Colour printing is made of 4 colours - CMYK (Cyan, Magenta, Yellow, Black) that when these translucent inks combine and overlap produce the final photographic and wide colour range. This is how colour magazines and brochures are printed. To put simply - RGB is light shining through your monitor and shows colour brighter and different than printed in CMYK - ink on card. These are 2 different colour spectrum and so you CAN NOT get the same colours in CMYK as in RGB so there is going to have to be some compromises. As RGB colours should only be used for website and computer graphics and not for things that go to professional printing because there are some colours that do not reproduce correctly when converted. So RGB colours in artwork have to be converted to CMYK colours. If you supply RGB artwork, we will convert it to CMYK which will match it to the closest colour matching available and we will sent you a proof. If you have a large area that you want solid black - we recommend using this CMYK breakdown - 40% Cyan, 40%Magenta, 40%Yellow, 100% Black . SOME BAD HABBITS... There are a few other techniques which have bad side affects. RGB Black" = 000 - don't use RGB BLACK which when converted to CMYK makes the black out of all 4 colours the result is a less dense black in solid areas. 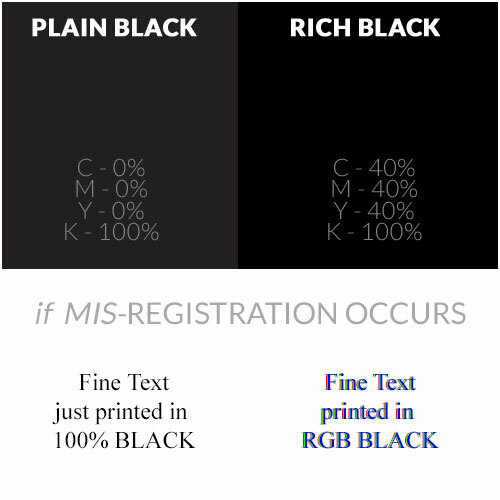 Also if you make fine text in RGB black it will then have to make fine text out of registering all 4 colours - so if any mis-registration happens you will see it and not be as sharp. AS A RULE: If you want sharp black text - just use 100% black only - if solid areas use 40%, 40%, 40% 100% as mentioned above. Don't use 100% of each colour - this may seem like a "good idea" but this will be rejected (like most printing houses) because of TOO MUCH INK DOWN and has NO VISUAL DIFFERENCE than the 40, 40, 40, 100 combination as shown above. The best way - most computers and programs will enable you to SAVE AS A PDF - just ensure that it saves the file with the best or HIGHEST QUALITY settings or it may down-size your images to low quality so the the file size is low. Another common way is to send artwork as a high quality image JPG - this is not as good as a vector PDF, but will be OK.
WHAT YOU CAN AND CAN NOT DO WITH ARTWORK? If you design a logo always create it at the highest quality large file - why? Because you/we can always get a great print by reducing a large high quality design down to a smaller high quality print (we call this DOWNSIZING) BUT CAN NOT produce a high quality bigger design from a small low quality graphic (this is called UPSIZING). For example some people take a photo or graphic from the internet (which is 72dpi quality) and want to enlarge it or print it at high quality (which we need 300DPI) - it will only print out blurry or pixelated. But we can get a extra large 72dpi image as reduce it to a business card smaller size because it will condense the pixels as we reduce it. Step 1). Go to GOOGLE IMAGES and do a search. Step 2). Under the search form at the top you will see a button saying "TOOLS" - click this to show another sub menu. Step 3). One of these is "SIZE" - Select "LARGE" or 'LARGER THAN..." for Google to only show those from your search results. 1). Dominant "COLOR" ie if you just want shades of blue or transparent etc. 4). "TIME" = You can even sort by most recent images - select a time range or specify a custom date range. 5). "SHOW SIZE" = Click this and it will display the size in pixels under each image so you can see what size these are. Step 1). 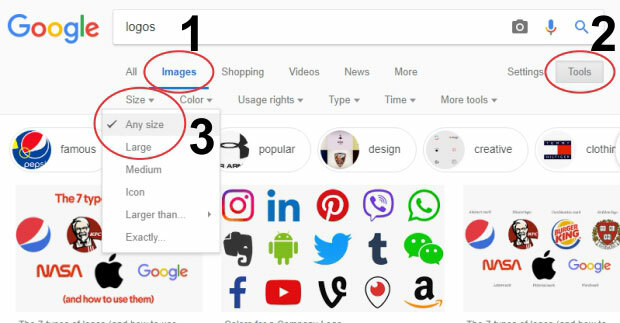 Go to GOOGLE IMAGES and in the search form on the right you will see an icon of a "camera" - click this icon to see a new pop up. Step 2). 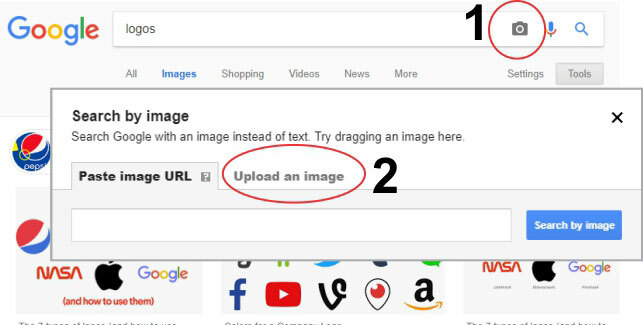 Here, you can either enter the URL of an image you see on the internet - or "UPLOAD AN IMAGE" - Upload your low quality image you have and Google will search the web and show any other different size versions of that image if it is on the internet.